BOTH national teachers unions are fed with the United States Department of Education! The LARGEST Teachers Union called for the RESIGNATION of U.S. Secretary of Education: Arne Duncan. WAKE UP CLUELESS KUSTER. We couldn’t help but notice the recent commercial by Rep. Annie Kuster who is attacking her opponent Marilinda Garcia. 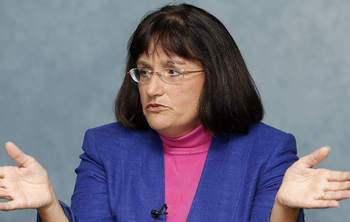 Kuster criticizes Garcia for opposing the U.S. Department of Education. The US DOE has a budget of $69 BILLION dollars. Money that could be spent on teacher salaries and in local classrooms. This is money WASTED as we can clearly see by their Common Core agenda that is being forced upon our local schools. YES, it’s worth considering abolishing the US DOE. WHY? We have a STATE Dept of Education AND a local School Board. Why do we need ANOTHER layer of bureaucracy that siphons money from our local schools? If you live in Kuster’s district, let her know that we do NOT appreciate the U.S. Dept. of Education waging war on our children. We do NOT appreciate their direct attack on our local teachers. They have TOO much power and we agree with Garcia, shut them DOWN. Let’s take OUR hard earned money and stop giving it to a Dept. that uses it to bribe us and attack our teachers. This entry was posted in Candidates, Political and tagged AnnieKuster, Clueless, Kuster on October 13, 2014 by Admin.